A group of university students and lecturers are on a road trip of a different kind as they travel over 4,000 km to test out their solar powered car the Ilanga II fuelled on nothing but good old sunshine. "It can do up to 140 km/h," says Nickey Janse van Rensburg, who lectures mechanical engineering at the University of Johannesburg's Energy Movement lab. "Because we don't have a lot of sun today we are doing 90 km/h,'' she said from the convoy snaking toward the Northern Cape town of Kimberley to show off the vehicle named after the Zulu word for sun. 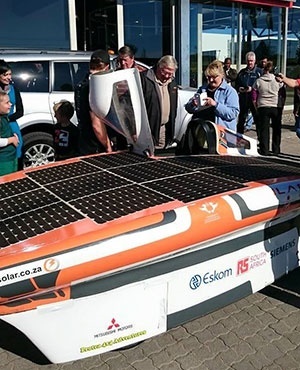 The University of Johannesburg (UJ) Energy Movement's solar powered electric car, the Ilanga II, left Johannesburg on 18 June on a Sub-Saharan adventure which saw the team cross the border into Namibia on Saturday, 20 June. After arriving in Windhoek on Monday, the team held a public lecture at the Polytechnic of Namibia's NBII Innovation Village. There students, the public and other future innovators got a chance to see one of the most advanced solar-powered electric cars on earth - first hand. During the 4,160 km road trip to the edges of innovation and beyond, the team of engineering students will be collecting and analysing data to optimise the performance of the vehicle and to prove the reliability of solar technology in motoring. The team of students, who developed the current Ilanga II from a previous prototype, take turns driving the wholly solar-powered vehicle, which cost approximately N$15 million in material, minds, logistics and fabricating hi-tech once-off components. They cruise along at about 80km/h, but can reach speeds of up to 140km/h and boast the same solar panels as those used on the Mars rover. The road trip will see them heading to Swakopmund and then on to Gaborone for one last public lecture before they return home to Johannesburg and the UJ Solar Lab to prepare for yet another epic feat - to set the solar-only land speed world record.